One more point today, in response to a question today. A definition is necessary for what St. Ignatius calls "desolation", which is the time of no consolations. This is a good and it is not the same as depression. If one is depressed, one should not be going to a spiritual advisor, but a trained Catholic psychiatrist or psychologist. Make sure he or she is a Thomist. But, desolation just means suffering, and lots of it. It is a life where suffering cannot be avoided. For some of us, this could be cancer, or the death of a loved one, or a failed marriage. For some, this suffering is not faced properly but avoided by activity and a lack of reflection. Reflection is absolutely necessary in desolation. So is faith. It is a time for trusting in God without consolations. Desolation is for mature souls only. Those who have gone through the basic stages of purification and are now entering the striping of the ego and the complete purification of the senses and spirit know this desolation. St. John of the Cross calls this the Dark Night. God has removed Himself so that one can be purified for His Real Self, not as one imagines Him. He leaves but He has not really left. He is Present, but only in the Passion. I do not think there are many young people who experience desolation in the Dark Night. If you are young and in inescapable suffering, take it as a gift. The yes to God in desolation is the yes of Christ in Gethsemane. As I am in Ireland, the day is almost done. The sun is setting slowly, as it does up here in the northern part. The long twilights are one reason why England built some of the largest and most amazing west windows in the Medieval cathedrals. The long twilight was captured in the naves. This is the first summer I intend to spend in Ireland, writing and praying. I have been to this island in the winter and in the autumn in the past and both times, it was cold. So far, it has been hot and sunny. The green fields and hedges cannot conceal a sense of loss, however, as Ireland has lost her identity. Spiritually, she is gasping for breath. On a Sunday, the Churches are half empty, but the malls and shops are full. The new religion is consumerism. And, the new abortion bill is part of the consumerist agenda. Babies cost money. Babies interfere with careers. Babies demand self-sacrifice, and love. Love is dying here. Almost all my friends here are Polish, Scottish, Polish, Scottish...Polish, Asian, Asian, and three Irish. Why? Because this is the TLM crowd of young people. There is no one my age that I can see at the TLM. There are older people, my parents' ages, and younger, much younger people. The twenty to thirty somethings form the new Church, but they are so few. And, they are not Irish. I grieve for Ireland on this Sunday. The land of the missing children-as if the Pied Piper had come down Grafton Street and stolen all the little children away. Lost children, lost identity. There is a psychological event which some people in concentration camps or prisons, or even monasteries experience. It is Loss of Identity. This can last a few days, or years. If it is a mental or emotional illness, loss of identity can be periodic. Loss of identity comes from broken families as well as the loss of Faith. Without the continuity of faithfulness in marriage, from parents, in the Church, one cannot develop properly. The lost generations are at least two now. And, people cannot identify with hatred, which is what has happened here. I do not think the Irish can find their identity without Catholicism. They are following the pipe of materialism and they will disappear as a nation if they do not rediscover that they are a nation, a people, persons only in Christ. ...real evangelization flows from personal holiness. Readers, do not use someone else's name if you are commenting. Use a blogger name or your own, and not someone else's name who is a living and real person. That is tantamount to lying. I am not going to comment on the new encyclical. There are many other commentators on this. It is a departure from what we have seen, so do not look for Benedict beyond the beginning, although it seems to reveal his notes..And, a good priest explained something to me about chasing after experiential religion. Today, I want to share with you the sermon at a TLM I attended. It was superb, on the Real Presence of the Body and Blood of Christ. Firstly, the holy priest said that our emphasis in the Church on the Body and Blood of Christ is centered on the Eucharist. 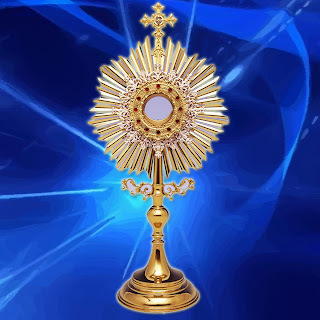 He noted that once Christ ascended into Heaven, in the Hypostatic Union-here defined on this link, that only in the Body and Blood of Christ in the Eucharist, is Christ's Blood present to us. 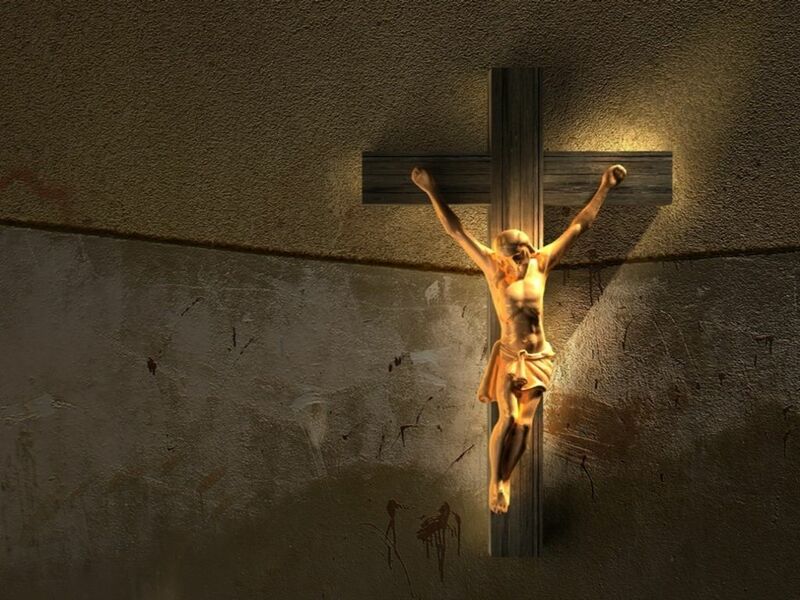 His blood is NOT in the various locations in the world. 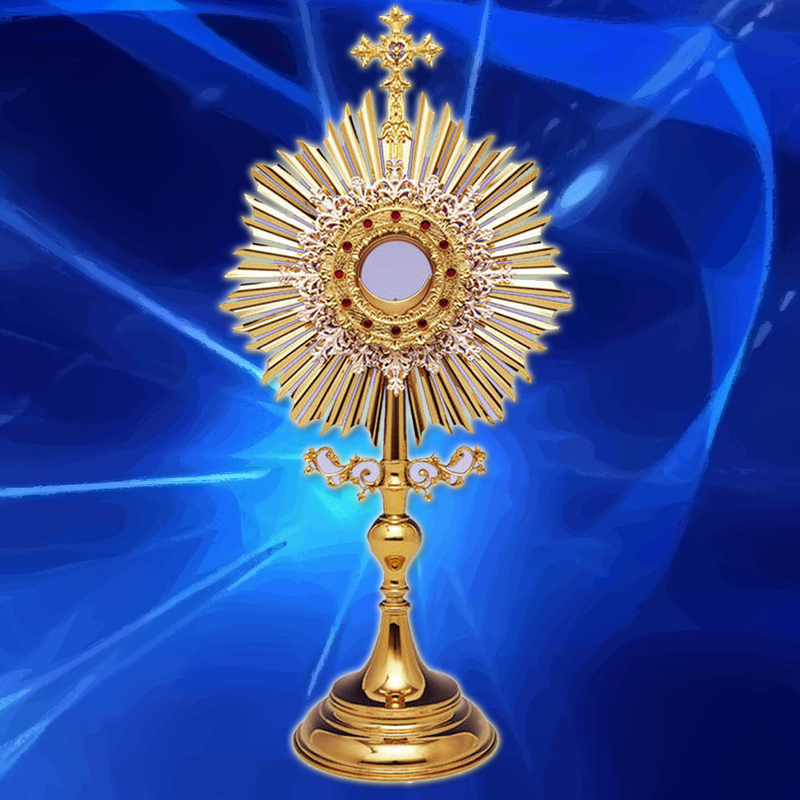 Those so-called miracles of blood are not Christ's blood, as He has given us only the Eucharist for such love and adoration. Again, this is an important distinction and one I appreciated, as there are too many people chasing after mystical phenomenon without looking keenly at the Daily Miracle on the Altar. Stop chasing after visions and phenomenon and go to Mass as often as possible. God bless you all.